Religious organizations have been a powerful influence in American social welfare history. In many significant ways, religious organizations and churches have contributed to advancing more humane programs and policies concerning orphans, slaves, the poor, the sick and others in need of assistance. Amana Colonies: A Utopian Community"The Amana Colonies were one of many utopian colonies established on American soil during the 18th and 19th centuries. There were hundreds of communal utopian experiments in the early United States, and the Shakers alone founded around 20 settlements. While great differences existed between the various utopian communities or colonies, each society shared a common bond in a vision of communal living in a utopian society." American Friends Service CommitteeThe American Friends Service Committee (AFSC) is a Quaker organization that promotes lasting peace with justice, as a practical expression of faith in action. Drawing on continuing spiritual insights and working with people of many backgrounds, we nurture the seeds of change and respect for human life that transform social relations and systems. First Methodist Parsonage in the United StatesWritten by Christopher J. Anderson, Head of Special Collections, Archives, and Methodist Librarian @ Drew University Library. Harmony Society: A Utopian CommunityThe Harmony Society, also called the Rappites, were similar to the Shakers in certain beliefs. Named after their founder, Johann Georg Rapp, the Rappites immigrated from Württemburg, Germany, to the United States in 1803, seeking religious freedom. Establishing a colony in Butler County, Pennsylvania, called Harmony, the Rappites held that the Bible was humanity's sole authority. Jewish Community Council of Washington, DC"Early History of the Jewish Community Council of Greater Washington (1938 – 1942)," compiled by Mrs. Henry Gichner. "The Jewish Community Council of Washington grew out of a desire on the part of many citizens for the creation of a body composed of representatives of all Jewish agencies and organizations authorized to speak for the Jewish community on matters of common concern. In 1938 the community was faced with a specific problem, that of the refugees, on which no one agency wished to set policy. " Jewish Social Service Agency of Metropolitan Washington, D.C.The Jewish Social Service Agency of Metropolitan Washington has its origins in two different agencies. The United Hebrew Charities was incorporated in 1893 "…to assist in relief of needy Hebrews" in Northwest Washington; the Hebrew Relief Society of the District of Columbia was organized to "…provide relief for needy Orthodox Hebrews" in Southeast Washington. The two agencies merged and incorporated in 1921 as the United Hebrew Relief Society of D.C.
Knights of St. Peter Claver (1909- )The Knights of Peter Claver organization was founded in 1909 in Mobile, Alabama. It is the largest African American Catholic lay organization in the United States. Lutheran Social Service of MinnesotaLutheran Social Service of Minnesota (LSS) is the largest private, nonprofit human service organization in Minnesota. It offers a comprehensive array of support services tailored to the unique needs of individuals, families and communities. Martyrs of MemphisIn 1878 the city of Memphis, Tennessee was struck by an epidemic of yellow fever, which so depopulated the area that the city lost its charter and was not reorganized for fourteen years. Almost everyone who could afford to do so left the city and fled to higher ground away from the river. There were in the city several communities of nuns, Anglican or Roman Catholic, who had the opportunity of leaving, but chose to stay and nurse the sick. Most of them, thirty-eight in all, were themselves killed by the fever. 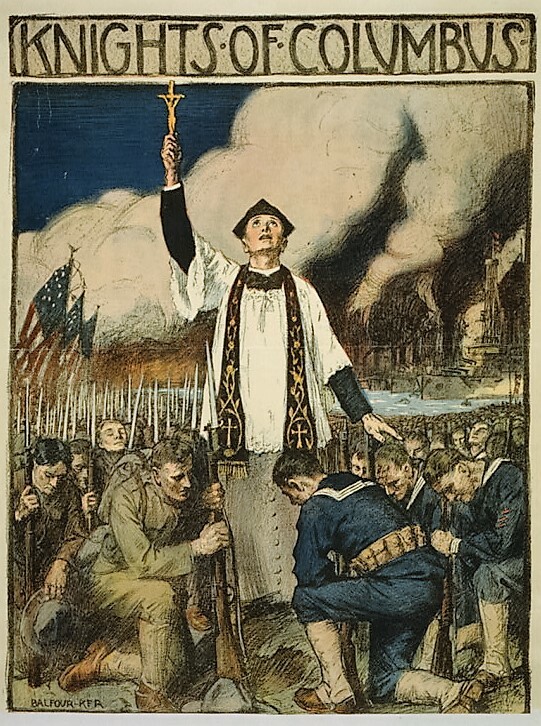 National Catholic Community ServiceThe National Catholic Community Service (NCCS) served the spiritual, social, educational, and recreational needs of the military and defense workers and their families from 1940 to 1980. Oneida Community (1848-1880): A Utopian CommunityThe Oneida Community (1848-1880) was a religiously based, socialist group, dedicated to living as one family and to sharing all property, work, and love. They called their 93,000 square foot home the Mansion House. Religion In Nineteenth-Century AmericaWritten by Dr. Graham Warder, Keene State College. "Converts to the new religious ways ardently strove to eliminate sin from themselves and from their society. The result was a faith that promoted social reforms of various kinds, among them abolitionism, temperance, health reform, and the asylum movement." Shakers - A Utopian Community: Founded In U.S. 1776Formally known as the United Society of Believers in Christ’s Second Coming, the Shakers developed their own religious expression which included communal living, productive labor, celibacy, pacifism, the equality of the sexes, and a ritual noted for its dancing and shaking. Volunteers of AmericaThis entry is about the Volunteers of America. It was excerpted from the booklet “Maud and Ballington Booth: The Founding of Volunteers of America – The Seeds of Change 1890 – 1935” authored by Anne Nixon and produced by The Human Spirit Initiative. Woman’s Christian Temperance UnionThe WCTU was a religious organization whose primary purpose was to combat the influence of alcohol on families and society. It was influential in the temperance movement, and supported the 18th Amendment.